Alfred, have you read St John of Damascus' treatise on the defense of icons yet? You are spamming me...that's gotta be against the rules. Not at all. Have you read St John of Damascus' treatise on the defense of icons yet? It's a simple question. The burden of proof is not on those who say it doesn't exist as its not mentioned. Its on those who say it does exist, because its impossible to prove a negative. If I say "I can throw this stone into outer space," the burden of proving I can is not on those doubting the claim, its on me who made it. I'm not saying the Church did practice icon veneration. Though I believe she very likely did, I'm not asserting this as an argument in this debate. Thave no reason to prove an argument I'm not making. 1. P cannot be proven false, therefore it must be true. 2. P cannot be proven true, therefore it must be false. I see you committing this fallacy quite often on this thread. You do this by asserting a negative proposition that you know you cannot prove then insist that you must be right until we provide evidence that proves otherwise. This is fundamentally a game played by those too intellectually lazy to defend their own theses with solid arguments. It's an asinine little game I intend not to play. What are you doing with your quotes of other posters that the text in your quotes doesn't match up with what was actually posted? There is no evidence the early church practiced icon veneration, the absence of any mention of it is inexplicable if they practiced icon veneration like the Orthodox, for the latter can hardly restrain themselves from writing about it----therefore the lack of writing about it indicates they did not practice icon veneration. Hasty and anachronistic generalization. You're drawing conclusions about the Early Church from the practice of the Church today without accounting for the differences between the specific circumstances the Early Church faced and the specific circumstances today's Church faces. "Indicates", not "is." Do a search on argument from silence and you will find my statement SILENCE proves nothing, one can only propose a likely explanation for the silence. There are other likely explanations I think you're overlooking in your rush to generalize from the Church's preaching today. 1)Icon veneration wasn't practiced ("NO"). BUT the Orthodox can hardly be silent about their images, therefore the silence about it in the Bible does indicate they didn't practice it. Again, a hasty and anachronistic generalization that overlooks other possible explanations. So it is universally believed they are silent about icon veneration because they didn't practice it. argumentum ad populum--IOW, an attempt to prove that something is true because everyone believes it's true. Everyone might be wrong. BTW, unless you have suddenly become everyone, you have no authority to present your own personal opinion as though everyone believes it. Therefore, to prove that incorrect, the burden of proof is on you to show where we missed seeing it in the historical record, the Bible or sub apostolic fathers. What? Have you suddenly developed split-personality disorder? Otherwise, you need to speak for yourself, buddy. You don't represent some nameless "we". You represent only yourself and your own opinion. Don't try to assemble some fictitious group of people who happen to agree with you just to give imaginary strength to your argument. Lacking that, the weight of the evidence is they did not practice it. Argument refuted as rife with logical fallacies. I will grant the possibility the Early Church may not have practiced the veneration of icons, since I'm not that well-versed in Church history, but the arguments you've advanced thus far to try to convince me that she most likely didn't are so full of shoddy logic that your case is not at all cogent. IOW, if I really want to know whether the Early Church venerated icons or not, I won't come looking to you for answers. Then icon veneration is NOT apostolic, and therefore YOU should be concerned given your desire to follow apostolic truth. Go back and do the homework needed to construct a much more cogent argument, then maybe I'll listen to you. Right now, you're just babbling incoherently. No, it's not against the rules. Just answer LBK's question and be done with it. Perssonism is a disparaging nickname referring to my statements, while the shortened form of John of Damascus wasn't at all, yet I was warned. I don't consider it a disparaging nickname - it is a clear attribution of a unique theological position (especially on this forum) to the person who postulated it, something that has been done on a number of occasions throughout history. With all due respect Father, if someone is objecting to the use of their name in such a way wouldn't it be the humble and Christian thing to do by respecting their wishes? Alfred is just as much an icon of Christ as any of us. God does not change, Jesus is God, therefore He does not want an image of His similitude either. Since you have expressed your admiration for the Muslims, and your arguement depends so much on this mantra, what do you say to your Muslims friends that agree with you, and then point out that since God does not change, He neither begots nor is begotten (Quran 112:3), and hence the Faith of the Apostles in the Incarnation of Christ is idolatrous blasphemy, therefore Jesus is not God? No, I did not and they are not my friends. Just as God used the Babylonians, Assyrians etc to chastise His people, so I believe He used Islam. 11 "And from the time that the regular sacrifice is abolished, and the abomination of desolation is set up, there will be 1,290 days. 12 "How blessed is he who keeps waiting and attains to the 1,335 days! 13 "But as for you, go your way to the end; then you will enter into rest and rise again for your allotted portion at the end of the age." Youd didn't answer the question. The Apostles present Christ to us as the icon of the invisible God. The Muslims say because God is transcendant, invisible, infinite and does not change, the Apostles therefore committed blasphemy, for Jesus cannot be God. You also haven't answered why God left the iconoclast Nestorians and took His protection away. Indeed, one could argue He never gave it, as the Nestorians, like most iconoclasts who claim Christ, never formed the majority nor controlled a state. Why did God, according to your intrepretatin, chastise the Nestorians, while He let the iconophile Orthodox survive, thrive and spread, surviving Islam and dominate a dozern or more coutnes and much of the globe? Why did the icon loving Rus' defeat the icon hating Jewish and Muslim khans of central asia? And was satan's grip, after it got slapped in the Iberian peninsula, too short to reach the icon loving West? Of course Israel's idolatry caused God to leave, which take His protection away, satan filled the void, with evil which included war. But since icons aren't idols, what's your point? Those dispatching their icons to slay me, I ignore. Btw, are you aware that the Christ loving Orthodox armies carried icons into battle, and carried them in procession atop the walls of their city to repal the invaders? The Black Madonna, the Queen of Poland, is a famous example brought to the West. In Constantinople, the icon of the Protection of the Theotokos records such an instance when the pagan Rus' armed forces were destroyed: their Orthodox Russian, Ukrainian and Belorussian descendents are the most fervent venerators of this icon. No, he is made in the image and likeness of God, but does not conform to the image and likenss of Christ. The Orthodox see Christ as He is. Mr. Persson is an icon, but that's besides the point. Arius, Macedonius, Nestorius, Eutyches were icons of God too, although they marred the icon of Christ by their heresy. Mr. Persson wants us to call his teaching apostolic. The Apostles preached Christ as the icon of the invisible God. Okay, summing up arguments already made that speak to this (you probably overlooked them because the replies contained pictorial evidence, and you don't answer our "icons sent against you") the presence of icons can be attested to in the historical record from the earliest time of the Church. They were used, much as the pictures and felt cut-outs of many a Protestant Sunday school and children's church, in order to aid the spreading of the Gospel to a largely illiterate population. The Gospel was not meant just for Jews and wealthy citizens of the Roman Empire (the only portion of the population with literacy), but (perhaps most especially) for the poor. We don't need writings about this, we have the actual pictures themselves (see jnorm88's posts above, if you do not mind sullying your eyes with visual evidence). Let us accept your argument from silence (just for the time being) that these icons were not "venerated" (that is to say, shown honor and respect) as they are today. That is all fine and well. But the icons from eras where there is a textual silence exist. Not exactly. Let us look into the historical record and see when it was that the Orthodox no longer maintained a standard of silence about their icons.... Ah yes, during the time of the Iconoclasts. Much like Trinitarian theology, which itself receives little textual evidence until it came under attack (by Arius and his spiritual descendants), the Iconophiles are silent until their icons come under attack. Perhaps, as you say, no reverence was shown before this point, but the very heights of the irreverence of the Iconoclasts prompted a reaction. St John of Damascus' treatise is one of these reactions, the outcry of just those illiterate peasants the icons were meant for is another. So that when the Seventh Council is called it is decided that a) icons are an acceptable means of transmission of the Gospel teachings and b) icons are worthy of the same respect and honor (veneration) that we would give to the Gospel. Which, BTW, I don't know if you know this, but we venerate the Gospel in much the same way we do icons, and have since the time of their writings. But there has been no loud theological defense of this fact, we don't proclaim it as often as we talk about our icons (Protestants not wanting to go around burning Bibles, for some reason), so obviously it is something that we've never really done and I am just making this little fact up on the spot (the historical record being silent and all). I've cited his works, and refuted them, much to your dismay...now I gotta answer brain dead questions just because you think I should? :Let him spam me forever...that only makes you gents look bad, not me. and do the homework needed to construct a much more cogent argument, then maybe I'll listen to you. Right now, you're just babbling incoherently. Your objection is specious, there is nothing different about human nature, that hasn't changed. The human nature of the Orthodox doesn't allow they practice their veneration of images in private, without witnesses, and never write about it. No, they trumpet it and even demand others bow down and kiss their images or they are denying xyz. So the loudness of the Orthodox comes from their fallen human nature, which doesn't change. Therefore when we see the humble God fearing Bible loving Christians of the first century say nothing about icon veneration, we know they are not like the Orthodox today. That is the fundamental objection to icons, that its not taught by the apostles. That is why the lack of testimony for icons in the early church is probative. Your objection is specious, there is nothing different about human nature, that hasn't changed. You might want to edit this. Your approach in your thread is most problematic since you make claims against people's posts that are untrue. For ex., early in the thread Fr George inferred that a post of yours could appear to be a childish rant & you dishonestly counter that you are being called an "idiot" so your whole approach is suspect. All one sees is accusation disguised as inquiry and then reactionary reply disguised as persecution. Perhaps you are sharing your alleged findings with others and you will present yourself as a reasonable guy trying to have an exchange with a brood of vipers. One thing evidence has been shown that icons existed preceding the final formulated canon and that the very theology of the canon & even incipient in the old covenant support the use of icons in the same pattern as the doctrine of the Trinity developed since there is no singular scriptural passage which actually expresses the Trinity. Early apostolic & subsequently martyred Christians read the Shepard of hermas in some churches since it was considered scripture in many churches (they probably do not count as "Bible loving" according to your distrted preaching in the tradtion of man). This only proves that you have read part of his works. I'm not sure it even proves that, given that he hasn't refuted them. It appears more that he has lifted some 5th hand citations from some tract akin to something Chick or the Watch Tower Society would put out. Sort of like sugar sprinkled so you won't notice the poison in your food. The question really is have you read the whole works of St. John? If you were to read the whole works you might see them in the whole context, rather than just the bits and pieces you chose. Or bits and pieces already chewed and spit out for him. LOL. Of course that's the problem. He doesn't have the context of the Bible: THE CHURCH. That there were pictures in the catacombs etc begs the question whether these were worshiped, and are irrelevant to what the apostles taught. Only in scripture do we read what the apostles taught, every other source is suspect or it would have been canonized. Of much less weight is the testimony of sub apostolic church fathers, presumably some of them were taught either by an apostle, or someone they taught. To go further away from the apostles begs the question what they apostles taught. Your argument also fails when you argue icons are teaching tools...1)if that's all they were, I wouldn't be objecting to them nor would you insist they be kissed as did the 7th council 2)As they image the Whole Christ in one icon, they teach the illiterate monophysite heresy, rendering the Transcendent infinite Jesus in two natures, into a finite image the illiterate believes represents the prototype. Your second argument is revisionist history. Icon veneration arose centuries after the apostles, as the heresy grew, iconoclasm grew, prior to that there was no need for iconoclasm. 6. Others of them employ outward marks, branding their disciples inside the lobe of the right ear. From among these also arose Marcellina, who came to Rome under [the episcopate of] Anicetus, and, holding these doctrines, she led multitudes astray. They style themselves Gnostics. They also possess images, some of them painted, and others formed from different kinds of material; while they maintain that a likeness of Christ was made by Pilate at that time when Jesus lived among them.300 They crown these images, and set them up along with the images of the philosophers of the world that is to say, with the images of Pythagoras, and Plato, and Aristotle, and the rest. They have also other modes of honouring these images, after the same manner of the Gentiles.5- Roberts, A., Donaldson, J., & Coxe, A. C. (1997). The Ante-Nicene Fathers Vol.I : Translations of the writings of the Fathers down to A.D. 325 (351). Oak Harbor: Logos Research Systems. God Does Not Give His Majesty to Another. Novatian[/i] (Novatian of Rome 235-258): We acknowledge, therefore, and know that he is God, the Creator of all things. He is our Lord, because of his power; our author, because of his creation. “He spoke, and all things were made. He commanded, and all things came forth.”﻿8﻿ Of him it is written, “You have made all things in wisdom.”﻿9﻿ Moses says of him, “God is in heaven above and on earth below,”﻿10﻿ and according to Isaiah, “He has measured the heavens with a span, the earth with the width of the fist”;﻿11﻿ he “looks upon the earth and makes it tremble.”﻿12﻿ He “holds the orb of the earth and those who live on it as if they were locusts”;﻿13﻿ he “weighed the mountains on scales and the groves on a balance,”﻿14﻿ by the exact precision of the divine plan. He laid out this weight of the earth’s mass with precise equipoise, lest the huge ill-balanced mass should easily fall into ruin, if they were not balanced by providential weights.﻿15﻿ It is he who says through the prophet, “I am God, and there is none beside me.”﻿16﻿ He says by means of the same prophet, “I will not give my majesty to another,”﻿17﻿ so that he might exclude all heathens and heretics with their images, proving that he is God who is not made by the hand of an artificer.﻿18﻿ Nor is he some God whom heretical ingenuity has devised. The Gnostic practice of icon veneration, like other heresies, was adopted by the Catholic church, but not without a fight, which we lost. But history is clear, icon veneration is a non apostolic practice. But, the One, Holy Catholic and Apostolic Church of which you have no part says that it is. Really, you have no argument. If it were only the veneration of icons that you reject, we might be able to have a conversation. But you have shown here that you reject far more than that, so we really have no common ground to start from. Its elementary deduction, as human nature does not allow the Orthodox religion be silent about icon veneration, wherever human religion is silent about icons, they aren't like the Orthodox. The church seen in the pages of the New Testament is silent about icons, therefore it isn't like the Orthodox. Indeed, the silence about icon veneration in the Bible is an overwhelming mass of irrefutable evidence they didn't practice it, given the heat and froth of the Orthodox manifest on this thread. Referring me to a thread is absurd, that's not proof...its like pointing to a public library and claiming "the refutation is there!" That ain't proof, its evasion. I've shown you otherwise, and yet you continue to stomp your feet and shout. Too bad. Fact is, nothing I've said has been refuted...its all been buried under icons, ad hominem, and tangential material. That is why you won't copy paste my argument with its precise refutation...none were given. The reason why I wouldn't do it before is because it is a tedious process - I'm 25 minutes in, and I've only copied 4 refutations for your 1st point of your first post; there are still probably a half a dozen more. You are at a loss how to respond...admit it. How childish of you. Pray that I run out of free time in my day before I finish the compilation. Still waiting for that compilation. NOT rushing you, just letting you know I patiently wait. Human Nature does not change? Oh really? Well, I guess all hope is lost. If human nature does not change then why does the mass murder who repents of his sins and becomes a Christian not go out and start killing again? What of the thief who repents and becomes a Christian who then no longer steals? What about those who have persecuted Christians who then become Christians and never persecute again? I guess those people are not human? Or perhaps human nature can not change with out outside circumstances. Now, excuse me, I have to go venerate a deceased Veteran for his service to his country. That didn't change his nature, only his personality. For many murders it has been shown that it is in their nature to murder, yet those who become saved murder not any more... That sounds like nature changing to me. We kiss the GOSPEL as well! Icons, as visual representations of the Gospel, are accorded with the same respect. (2) Is only useful if one takes a full Iconoclast position and argues against ANY depiction of Christ, whether or not such an image is venerated. You have already stated many times over now that an image is okay. So now the question is that of veneration. St Irenaeus' complaint, if one reads the whole thing and does not just settle on "images", is that the images are set along with those of the Greek philosophers! Surely our Christ deserves pride of place, and will not share His worship with Pythagoras, Plato, and Aristotle, just as He will not share His worship with Buddha, Mohammed, and Krishna. Novatian was a heretic and an Anti-pope, first of all. Second, his writings are against those who fell during the persecutions and offered sacrifice to the idols of the Roman gods in order to save their lives, as would once again be seen if his works were taken from their proper context and not just a modern commentary (on the Old Testament at that!). His heresy was his refusal to forgive those who fell during the persecution instead offering only damnation. I'm sorry, you'll have to do better than Gnostics (the liberal ecumenicists of Rome) and Roman gods. Why, its a cogent argument. Human nature doesn't allow divine words not be written down, the testimony of history supports that. That's what make Catholic claims to have apostolic tradition from the very lips of the apostles, so unbelievable. If they did, they would have written it down, and canonized it. Icon veneration doesn't happen in a corner, its a public activity. Just as we can locate icon veneration by the "noise" it makes i.e., by the statements of icon venerators in their writings, so also we can determine who is not practicing icon veneration, by the lack of references to it in their writings. The Bible never refers to icon veneration in any context, therefore they are among the groups that didn't practice it. Therefore icon veneration is not an apostolic practice. Your second objection is unsound ad hominem. His witness about his day vis a vis icons stands, there is no record of anyone from his time disputing this testimony. To illustrate, if ad hominem is sound, then when Hitler says "2+2=4" we must reject that also, as he was a Progressive fully enabled. Then explain how acts change a person's human nature. Does repentance result in a physical change? Does one's heart grow bigger? What happens to one's material form when they stop murdering, what new "organ" or body part appears? Well we can go one step further than icon veneration and find that relic veneration was practiced by the early Christians. In the martyrdom of Polycarp (2nd c.) it is stated that the devil, "...proceeded to do his best to arrainge that at least we should not get possession of his (St. Polycarp's) mortal remains, although numbers of us were anxious to do this and to claim our share in the hallowed relics." Tertullian asserts that St. Polycarp was appointed by the apostle St. John, he was known by St. Ignatius (who was known by St.Paul), and highly revered by St. Irenaeus whose words our inquisitor has used in attemp to undermine holy tradtion. So what does he know from the Bible of what is holy tradition vs. the tradition of man? Why, its a cogent argument. Human nature doesn't allow divine words not be written down, the testimony of history supports that. That's what make Catholic claims to have apostolic tradition from the very lips of the apostles, so unbelievable. If they did, they would have written it down, and canonized it. I Clement 44:Our apostles also knew, through our Lord Jesus Christ, and there would be strife on account of the office(1) of the episcopate. For this reason, therefore, inasmuch as they had obtained a perfect fore-knowledge of this, they appointed those [ministers] already mentioned, and afterwards gave instructions,(2) that when these should fall asleep, other approved men should succeed them in their ministry. We are of opinion, therefore, that those appointed by them,(3) or afterwards by other eminent men, with the consent of the whole Church, and who have blame-lessly served the flock of Christ in a humble, peaceable, and disinterested spirit, and have for a long time possessed the good opinion of all, cannot be justly dismissed from the ministry. For our sin will not be small, if we eject from(1) the episcopate(4) those who have blamelessly and holily fulfilled its duties. (5) Blessed are those presbyters who, having finished their course before now, have obtained a fruitful and perfect departure [from this world]; for they have no fear lest any one deprive them of the place now appointed them. But we see that ye have removed some men of excellent behaviour from the ministry, which they fulfilled blamelessly and with honour. Irenaeus' outcry was about these images being placed with other images of pagan philosophers. Placing the image of the Divine Lord in the ranks of human philosophers was the symbolic version of the statement: "Jesus was a great teacher, like Plato or Buddha, but that's all he was." Note that by the time of Irenaeus icons adorned churches all over, and he says not one word about that. AND your second objection is ad hominem. His witness about his day vis a vis icons stands, there is no record of anyone from his time disputing this testimony. To illustrate, if ad hominem is sound, then when Hitler says 2+2=4" we must reject that also, because he was a Progressive. Going to a heretic to find the proper practice of the Church is like going to a Scientologist to find the truth behind psychiatry. Still, I treat Novatian's statement, which is about Christians who bought out of martyrdom by offering sacrifice to idols (actual idols of actual Roman gods or the pagan Emperor), which was Novatian's biggest pet peeve. He is not speaking of icons at all. But the fact that Novatian was a heretic does come into play. To illustrate: If Hitler (have we reached Godwin's law already?) were a mathematician who conclusively stated that 5+5= 12 then we might want to go back and recheck his figures for 2+2, just to be on the safe side. Only proves we cannot go far from the apostles, if we are to learn what they believed. "Claim our share," neither can the ghoulish practice of dismembering the dead be found in the New Testament. When Jesus died, they no one "claimed their share" of body parts. When James was stoned, same thing. Not once in the NT do we see the ghoulish superstition. That Polycarp is relevant to what the apostles taught is not disputed, someone writing about him in the 2nd century, is. Someone writing about him in the 2nd century, which is the same century in which he died, is irrelevant? The "claiming of the share" by the way refers to recovering the body of St Polycarp, not dismemberment (St Joseph of Arimethea "claimed" this particular "share" after our Lord died). St Polycarp's body was seen by the Church he led as their inheritance, and it was practice of the ancient Church to commemorate a martyr over their remains on the anniversary of the day of their death. Much the same as it was the practice of pious Jews to gather in the tombs of the Patriarchs in remembrance. Our Lord would have been commemorated by His disciples in this way, except He did something beyond all expectation. By the way, refer to the bones of Elisha (II Kings 13:21) for an account of God working a miracle through the remains of a holy man. Beneath my "Its a cogent argument" you cite Joh 21:25 hyperbole as proof its wrong? That's hyperbole, an exaggeration, literally the earth certainly can contain all that Christ did in those 3 1/2 years of ministry. A moderate size book can contain every word and deed. John's hyperbole expresses His appreciation of what Christ did, its importance far greater than human language can communicate, and in that sense the world cannot contain the books. The soundness of my premise is proved by the world's religions...whenever words are thought to be divine, they are written down into "holy books". A relevant example, Jewish oral tradition was eventually written down, the Mishnah in the Talmud. Bible manuscripts were copied by the thousands. These facts make Catholic claims of possessing apostolic oral tradition only the Magisterium can interpret, incredible. IN fact, their claim is analogous to Mormon Joseph Smiths claim to finding golden tablets that could be read only with special glasses. One could be a metaphor of the other. As for I Clement, this thread is about icon veneration by the apostolic church which your reply glaringly omits any proof for. The point is, Ireneaus isn't like any modern Orthodox writer today, therefore He wasn't a modern Orthodox. He was a primitive Orthodox like me. Finally, ad hominem against Novatian's testimony about icons is unsound. If you could find a contemporary of his that disputes his testimony about this, you would cite it. Instead you smear him because his testimony is correct, only heretics venerate icons. That the heresy overtook the Catholic church is irrelevant and immaterial, we are discussing what the apostles likely believed. I only cite him to show the "silence" about icons stretches far from the apostles in time. All proper Christian burial would be observed since apostolic Christians administered the rite. since St. Polycarp died in the 2nd c. the authentic eyewitness account was written then & preserved in the apostolic tradition. Your earler claims of us (meaning those who you perceive as being apostolic) are faulty, unsupported by sources, & only relies on how you interpret scripture. Yes, that's "hearsay," inadmissible testimony because that kind of testimony is notoriously unreliable. Given the ghoulish glee over claiming their share of body parts, its odd any think this is Christian. Find that practice in Jesus' teachings. Your Jewish analogy also fails, they did not exhume the dead and "claim their share" of remains. What they believed does not prove what Polycarp believed and certainly not what the apostles taught. Can you find Polycarp "claiming his share" of body parts? That some in the Second Century were robbing graves does not make Polycarp a relic merchant. And all this should prove too much...unless you want icon veneration likened to greedily claiming "their share" of body parts from corpses. Lets see you claim to be in apostolic sucession & yet say that someone (me) who finds an apostolic source as evidence of a veneration practice by apostolic Christians of the remains a martyred apsotolic Christian & that I trust these people as observing proper Christian burial rite as relying on unreliable hearsay? You were doing much better in this phase of the thread when you cited St. Irenaeus to bolster your point & even though there is disagreement it was fair & square exchange. "Doctrine which ye have learned", the action is completed in Paul's time. Therefore doctrines which arose centuries later are not apostolic and all who practice things not taught by the apostles, are not apostolic. Again, "You keep using that word. I do not think it means what you think it means." And eyewitness account is the exact opposite of hearsay. It is firsthand evidence. Since when is it grave robbing to give someone a proper burial? I guess Moses was a grave robber for transporting Joseph's bones from Egypt to Canaan. No, they buried their dead in tombs, as most of pious humanity was buried before the Black Plague. "The centurion then, seeing the strife excited by the Jews, placed the body in the midst of the fire, and consumed it. Accordingly, we afterwards took up his bones, as being more precious than the most exquisite jewels, and more purified than gold, and deposited them in a fitting place, whither, being gathered together, as opportunity is allowed us, with joy and rejoicing, the Lord shall grant us to celebrate the anniversary of his martyrdom, both in memory of those who have already finished their course, and for the exercising and preparation of those yet to walk in their steps." Without referring to Novatian's heretical belief (that those Christians who offered sacrifice to Roman idols during the persecutions could never be forgiven) how am I to place your passage into the proper context? Here goes: Novatian wasn't speaking of the pictures used in the Church. What Novatian was speaking of were IDOLS of Roman GODS and EMPERORS. The "heresy" Novatian was condemning was the belief that Christians who fell to temptation (to offer the sacrifices to Roman GODS in order to save their lives) during the persecutions could, after the persecutions ended, ever be forgiven. Which, if you knew anything of Novatian's writings, beliefs, and life, you would already know. Beneath my "Its a cogent argument" you cite Joh 21:25 hyperbole as proof its wrong? You seize on the "hyperbole" of St John while overlooking: "And there are also many other things Jesus did..."
These facts make Catholic claims of possessing apostolic oral tradition only the Magisterium can interpret, incredible. Well, you're on an Orthodox discussion board. I believe so far only one Roman Catholic and defender of the Magisterium has gotten involved so far. Our interpretation of Holy Tradition depends upon Ecumenical Councils, in the tradition of the Apostles who had a little meeting in Acts 15. Or a relic like one of his sandals perhaps? I have a picture here of my wife who passed away.. I think I'll toddle on over and give it a kiss. It is apparent to me that you have nature and body confused. You use the definition of the word nature to "refute" my argument when you use the word referring to the world and not to man. Hmmmm... I believe that Merriam-Webster has proved you wrong here. I see people change their character all of the time. For an example, I knew this one guy in my National Guard unit who was kind of shy and talked to only a very few people; however, shortly after we arrived in Iraq his character (nature) changed and he became more outgoing, and to be honest kind of pompous. His brother-in-law was actually surprised as he knew this guy since highschool and had never seen him act this way. Speaking of being precise... See how I included the whole definition of nature? You only used the first definition and stopped there because that was the definition that you wanted to use to support your argument, as you have been doing with scripture as well. Good advice, I suggest you take it to heart. It's divine inspiration, and command:"What I tell you in darkness that speak ye in light and what ye hear in the ear that preach ye upon the housetops." Mat. 10:27. 14:6"Jesus answered, “I am the way and the truth and the life. No one comes to the Father except through me. 9Jesus answered: “Don’t you know me, Philip, even after I have been among you such a long time? Anyone who has seen Me has seen the Father. How can you say, ‘Show us the Father’? 10Don’t you believe that I am in the Father, and that the Father is in Me? The words I say to you are not just My own. Rather, it is the Father, living in Me, who is doing His work. 11Believe Me when I say that I am in the Father and the Father is in Me; or at least believe on the evidence of the miracles themselves. 15“If you love me, you will obey what I command. 16And I will ask the Father, and He will give you another Counselor to be with you forever— 17the Spirit of truth. The world cannot accept Him, because it neither sees iHm nor knows Him. But you know Him, for He lives with you and will be in you. 18I will not leave you as orphans; I will come to you. 19Before long, the world will not see me anymore, but you will see Me. Because I live, you also will live. 20On that day you will realize that I am in My Father, and you are in Me, and I am in you. 25“All this I have spoken while still with you. 15:26"But when the Comforter is come whom I will send unto you from the Father even the Spirit of truth which proceedeth from the Father He shall testify of Me. 27And you also must testify, for you have been with Me from the beginning." John 14:6-25, 15:26-27. "But ye shall receive power after that the Holy Ghost is come upon you and ye shall be witnesses unto Me both in Jerusalem and in all Judaea and in Samaria and unto the uttermost part of the earth." Acts 1:8.
and never write about it. Since you are not a student of history I see how you make this mistake. Take just the written evidence between 325 (Coucnil of Nicea) and 722 (Leo III's edict against the Holy Icons). The written evidence is in abundance, but yet mostly is silent on the veneration of the Holy Icons, despite we have plenty of physical evidence (the actual icons themselves) and the occational off hand reference to them, many of which St. John collects, e.g. Listen to what I am going to say as a proof that images are no new invention. It is an ancient practice well known to the best and foremost of the fathers. Elladios, the disciple of blessed Basil and his successor, says in his Life of Basil that the holy man was standing by the image of Our Lady, on which was painted also the likeness of Mercurius, the renowned martyr. He was standing by it asking for the removal of the impious apostate Julian, and he received this revelation from the statue. He saw the. martyr vanish for 'a time, and then reappear,-holding a bloody spear. Julian was killed from a spear appearing out of nowhere while fighting the Zoroastrian empire (who were, btw, iconoclastic and banned images in worship. That didn't protect them from being wipped out by the Muslims, unlike the Christian empires and kingdoms who spread). To this day differences among the Orthodox on icons and iconography persist, although we differ not a jot on the theology of the icon. What you characterize as Orthodox behavior applies only to the Roman Orthodox, who were martyred under the iconoclast emperors, and the Slavs, who got their practice from Constantinople. The Orthodox in the West, outside of the iconoclasts reach, continued to take icons for granted until you Protestants appeared nearly a millenium later: compare a Gothic or Romanesque Church with a Baroque one built after the Protestants started smaching icons in the West. In the West, the Melkite EO resembled the Roman Orthodox because of their links to Constantinople. The Copts, Syriac and Armenians remained low key for the simple reason that the only ones burning their icons, the Muslims, were burning their Crosses and Bibles as well, as well as slaughtering them and burning their Churches. The fact that the Nestorians didn't have icons didn't make the Muslims stop burning the Nestroian churches with their crosses and Bibles, as well as slaughtering the Nestorians. The Ethiopian Orthodox, neither connected to Constantinople's iconoclastic period nor conquered by it's Muslim inspiration barely talk about icons at all, although it is obvious that they venerate them all over the place. 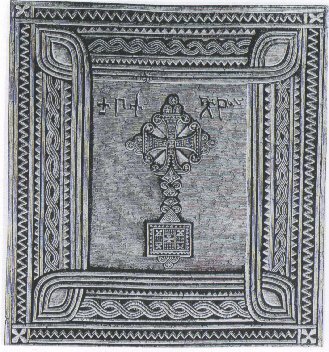 They talk far, FAR more about the Tabot, the tablet with the Ten Commandments written on it representing the Ark of the Covenant, in every Ethiopian Church. It corresponds to our Antimens, the Syriac Tabilitho, and Rome's Altar Stone (I know those terms mean nothing to you, but they do to our readers, and others will learn). No one needed to beg for veneration of the Holy Icons when no one questioned it. And oh, btw, the Fathers of the Church were about as silent about Trinitarian Theology until the 4th century, around the same time as St. Basil, his biography, and the miracle of the icon of St. Mercurius. The Incarnation. Not xyz, the Alpha and Omega. No, it comes from the Apostles' preaching, which doesn't change. Odd that you bring up the loudness of the Orthodox. Muslim polemicists make the same complaint about us singing our praises of Christ too loud. Take your iconoclast spectacles off. You are seeing things, or rather, not seeing things. the humble God fearing Bible loving Christians of the first century say nothing about icon veneration, we know they are not like the Orthodox today. LOL. The first century is silent on the New Testament canon too. And for that matter, the OT canon: it's not until the rise of the Church that the Jews fixed the canon you adopt from them, and it wasn't until the heresy of Marcion that the Church gave anythought to the OT, and until the Ebionites split off from the Hebrew Orthodox that the Church gave thought to the NT Canon. The idea of the canon of Four Gospels doesn't appear until c. 185 in St. Iranaeus. The Orthodox of today are the humble God fearing Bible loving Christians of the first century, in the 21st century. And in the first century we listened to the Apostles preaching the Icon of the invisible God. No, that's your fundamental claim, to speak for the apostles while walking disorderly and not in the way of the Tradition received of them. The Church, which actually does speak for them, stands firm in the Tradition received of them, and enjoin the icon of Christ the icon of the inviisble God. Unlike sola scriptura, there is no lack of testimony for icons in the early church. Ahh, but you overlook the fact that this has nothing to do with human nature. Historical circumstances change, and that's a fact. And that you can keep on saying that icons were not used in the Early Church without addressing the contradictory evidence provided since my last post shows that you're really not reading us and engaging our arguments. Merely repeating the same old claims ad infinitum and ad nauseum won't make them true, especially when these claims you keep repeating just get shot full of holes each time you bring them up. You really need to come up with some new material. For someone who can recognize the argument from silence and that it's generally seen as a fallacy, you certainly like to use it a lot. Again, as I'd already mentioned earlier, you can't just take someone whose authority we rejected 1800 years ago and parade him about as though he's an Early Church Father to whom we owe our obedience. You're going to have to do much better than trot out that old canard if you mean to convince us of anything. Since so many others have already refuted this claim here, I'm not going to add anything to what they've already done. Could the heat and froth on this thread be because you're attacking our faith? This thread is actually a microcosm of why we became so vocal in defending our veneration of icons during the iconoclastic controversies. If you hadn't come along to attack us, we would be devoting our time to talking about other things. Likewise, what the Orthodox believe and practice today cannot be used to prove what the Early Church did NOT believe and practice back in their day. Interesting: you remind me of the Jehovah's Witness fellow who came over to my front porch a month ago. Just as dogmatic, close-minded and wrong, but with triple the attitude.